Wherefore, once again I conjure you that, on the one hand, the Alexandrians show themselves forbearing and kindly towards the Jews who for many years have dwelt in the same city, and dishonour none of the rites observed by them in the worship of their god, but allow them to observe their customs as in the time of the Deified Augustus, which customs I also, after hearing both sides, have sanctioned. (Bust of Emperor Claudius.) And on the other hand, I explicitly order the Jews not to agitate for more privileges than they formerly possessed, and not in the future to send out a separate embassy as though they lived in a separate city (a thing unprecedented), and not to force their way into gymnasiarchic or cosmetic games, while enjoying their own privileges and sharing a great abundance of advantages in a city not their own, and not to bring in or admit Jews who come down the river from Egypt or from Syria, a proceeding which will compel me to conceive serious suspicions. Otherwise I will by all means take vengeance on them as fomenters of which is a general plague infecting the whole world. Claudius expelled all Jews from Rome in the year 50 (apparently, according to Suetonius, ‘they acted without ceasing at the instigation of Chrestus’) and, as Pontifex Maximus, tried to stop the expansion of Eastern cults, including Christianity and Judaism, into the Empire. Year 50. Judea is already part of the Roman Empire, but its Romanisation will never materialise; on the contrary, the Judaisation of Rome itself will be achieved. Of Nero we will talk in the article on Christianity. His wife, an idle harlot named Poppaea Sabina, was openly sympathetic to Jews and Christians, and conspired behind the emperor’s back to favour them. Thus, for example, through Poppaea Sabina, Flavius Josephus himself was freed, who had been sent to Rome in order to negotiate better conditions for his people. The Roman minister Sextus Afranius Burrus was assassinated in the year 62 by orders of Poppaea Sabina, or perhaps by Jews, after he denied them Roman citizenship in Greece. The emperor, tired of having the conspiracy near him, had his wife executed. The official version is that he kicked her on the belly while she was pregnant. The problem is that those who divulged this version had a strong enmity with the emperor, so it should be taken with caution. This was followed by a bloodthirsty Roman repression against Jews and Christians, in which Jewish ‘revolutionaries’ like Saint Paul and Saint Peter fell. This execution of key characters in the Jewish strategic movement to infect the Roman foundations, along with some other factors, would be the trigger for a massive Jewish revolt, which we will deal with in the next article. 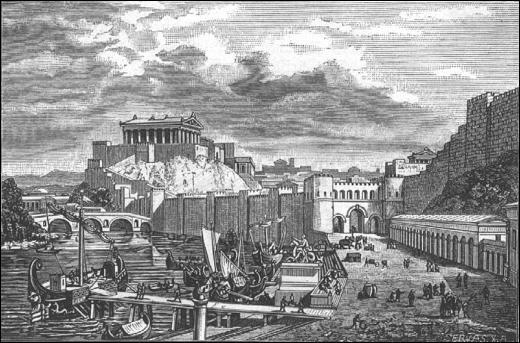 In 38, Caligula, the successor of Tiberius, sends his friend Herod Agrippa to the troubled city of Alexandria, to watch over Aulus Avilius Flaccus, the prefect of Egypt, who did not enjoy precisely the confidence of the emperor and who—according to the Jewish philosopher Philo of Alexandria (Contra Flaccus)—was an authentic villain. The arrival of Agrippa to Alexandria was greeted with great protests by the Greek community, as they thought he was coming to proclaim himself king of the Jews. Agrippa was insulted by a crowd, and Flaccus did nothing to punish the offenders, despite the fact that the victim was an envoy of the emperor. This encouraged the Greeks to demand that statues of Caligula be placed in the synagogues, as a provocation to Jewry. This simple act seemed to be the sign of an uprising: the Greeks and Egyptians attacked the synagogues and set them on fire. The Jews were expelled from their homes, which were looted, and thereafter segregated in a ghetto from which they could not leave: since they were stoned, beaten or burned alive, while others ended up in the sand to serve as food to the beasts in those macabre circus shows so common in the Roman world. According to Philo, Flaccus did nothing to prevent these riots and murders, and even supported them, as did the Egyptian Apion, whom we have seen criticising the Jewish quarter in the section devoted to Hellenistic anti-Semitism. To celebrate the emperor’s birthday (August 31, a Shabbat), members of the Jewish council were arrested and flogged in the theatre; others were crucified. When the Jewish community reacted, the Roman soldiers retaliated by looting and burning down thousands of Jewish houses, desecrating the synagogues and killing 50,000 Jews. When they were ordered to cease the killing, the local Greek population, inflamed by Apion (not surprisingly, Flavius Josephus has a work called Contra Apion) continued the riots. Desperate, the Jews sent Philo of Alexandria to reason with the Roman authorities. The Jewish philosopher wrote a text entitled Contra Flaccus and, along with the surely negative report that Agrippa had given to Caligula, the governor was executed. After these events, things calmed down and the Jews did not suffer violence as long as they stayed within the confines of their ghetto. However, although Flaccus’ successor allowed the Alexandrian Jewry to give their version of the events, in the year 40 there were again riots among the Jews (who were outraged by the construction of an altar) and among the Greeks, who accused the Jews of refusing to worship the emperor. The religious Jews ordered to destroy the altar and, in retaliation, Caligula made a decision that really showed how little he knew the Jewish quarter: he ordered to place a statue of himself in the Temple of Jerusalem. According to Philo, Caligula ‘considered the majority of Jews suspects, as if they were the only people who wished to oppose him’ (On the Embassy to Gaius and Flaccus). Publius Petronius, governor of Syria, who knew the Jews well and feared the possibility of a civil war, tried to delay as long as possible the placement of the statue, until Agrippa convinced Caligula that it was a bad decision. In 41, Caligula, who already promised to be an anti-Jewish emperor, was assassinated in Rome, which unleashed the violence of his German bodyguards, who had not been able to prevent his death and who, because of their peculiar sense of fidelity, tried to avenge him by killing many conspirators, senators and even innocent bystanders who had the misfortune to be in the wrong place at the wrong time. Claudius, the uncle of Caligula, would become the master of the situation and, after being appointed emperor by the Praetorian Guard, ordered the execution of the assassins of his nephew, many of whom were political magistrates who wanted to reinstate the Republic. In this way, we do not have a single Roman emperor who has participated in harsh Jewish reprisals who has not been defamed by accusations of homosexuality, cruelty or perversion. The historian José Manuel Roldán Hervás has dismantled many of the false accusations against the historical figure of Caligula. Nevertheless, the writers of Classical antiquity themselves clearly recognized and wrote about the problem, as do those few of today’s professional historians with courage enough to buck the blackout on the mention of race in history. An example of the latter is the distinguished Swedish historian Martin Nilsson, for many years professor at the University of Lund. Another distinguished historian, the late Tenney Frank, professor at Bryn Mawr and Johns Hopkins, made a careful survey of Roman tomb inscriptions. He studied 13,900 inscriptions, separating them into categories based on the ethnicity or probable ethnicity indicated by the names and corollary evidence. Professor Frank estimated that by the end of the first century A.D. 90 per cent of the free plebeians in Rome were Levantines or part-Levantines. 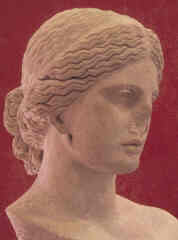 Fewer than ten per cent could claim unmixed Italian ancestry, and of the seven fewer were of pure Indo-European stock. One problem which Frank ran into was the tendency of non- Italians to disguise their ancestry by changing their names. It was easy enough to separate Greek and Syrian and Hebrew names from Latin ones, but a Latin name which had been adopted rather than inherited could often only be detected by noting the non-Latin names of the parents on the same tomb. Then too, just as Jewish name-changers today often give themselves away by choosing a non-Jewish first name which has become so popular among their brethren that few non-Jews would dream of burdening their own children—with it (Murray, Seymour, Irving are examples), Frank found the same clues among many “Latin” names. As for the Greek names, the great majority of them did not belong to Hellenes but to Levantines from the remnants of Alexander’s Oriental empire. The name “Roman,” in other words, came to mean as little as the name “American” is coming to mean today. And yet, just as White Americans are bringing about their downfall through greed and timidity and indifference, so did Rome’s patricians cause their own end.